If you hadn’t yet caught on, this is part four in a series looking at Membership Plugins for WordPress. I say that because there are two threads running thru all of these reviews. The first is the scoring grades (and criteria). The grades are at the bottom of each post; the criteria is in the second post in the series. The other thread are the lessons learned from each of these plugins. Every plugin does something right that product folks and developers can learn from. Every plugin does something right that product folks and developers can learn from. Today we’re going to look at Restrict Content Pro. If you’re going to evaluate a product designed and developed by one of the most well-known and prolific WordPress developers out there (in case you didn’t know, his name is Pippin Williamson), you should go into it knowing three things. The documentation you’ll get for the product is excellent. The support you’ll get for the product is excellent. The features you’ll get aren’t by chance or a mistake. I say that because most of the time, when I review a product, I include a ton of screenshots. That’s mostly because screenshots on product sites tend to be lacking. This isn’t the case with Restrict Content Pro. He has put all the screens out for you to see long before you spend a cent. I also spend a decent amount of time articulating how to do something – as in a tutorial – which is silly when you’re reviewing Pippin’s plugin – because he’s written them already – and they’re great. Here’s a simple example. Want to hide a menu item from a non-logged in user? Here’s how. And if you have a question, you can easily submit a question. So that brings us to scope. And that’s worth a bit of discussion. When you dig into RCP, you’ll notice a couple things right away. A person can only have one membership / subscription. 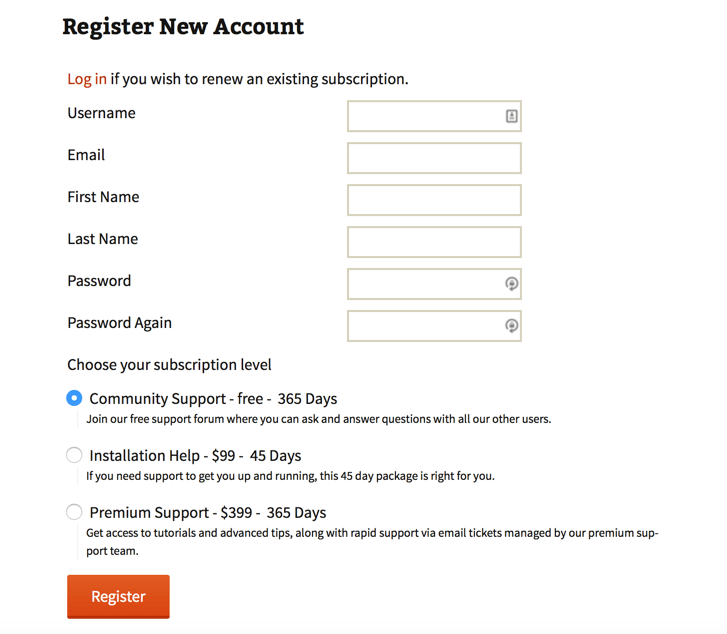 There is a way for them to upgrade to the next level of a subscription but this isn’t a plugin you’ll use to create a site protecting “courses” where a person might want to purchase 2 different subscriptions. A site owner (the one setting up their site using RCP) can immediately support PayPal and Stripe without any extra work (or downloadable extensions). Further, Pippin has completely re-written the codebase that supports payment gateways so that developers can create additional gateways as well. Additionally, the code he’s written around “members” – meaning the underlying methods that are available to renew, cancel and update a member’s subscription all speak to a particular approach that Pippin has taken with his plugin. Note, I’ve not ever talked to Pippin about this. So this is (again) my take on this plugin and my own observation about this codebase. First let me say – if you’re a person who just wants to install a plugin, get it configured, and run a site where you protect content – you can totally do that with Restrict Content Pro. The settings are easy and straightforward. There aren’t tons of them. They’re cleanly designed and you can see an emphasis on member management and reporting. I wanted to get that out of the way so I could focus on a different aspect of this plugin that puts it at the top of all the membership plugins if you’re a particular kind of person trying to do a particular kind of job. Restrict Content Pro feels like a plugin that is the boilerplate for your own custom membership solution that you build using RCP as the starting point. Let me say it a different way that I think may help explain what I mean. You know how people used to customize themes, only to see their customizations disappear when the theme was updated? Everyone hated that. So then some smart people came up with Child Themes. That’s where you write a bit of code – mostly the things you want different – and leverage all of the rest from the Parent Theme, and you’re all set. Restrict Content Pro feels like the Membership Parent Plugin for all your customizations and Membership Child Plugins. It’s like @pippinsplugins built a solid plugin and suggests you take it even further. This is different than saying the developer wrote good documentation. Some other developers do that. But this developer didn’t write documentation telling you how to use his plugin. This developer wrote documentation telling you how to change his plugin to do what you want. 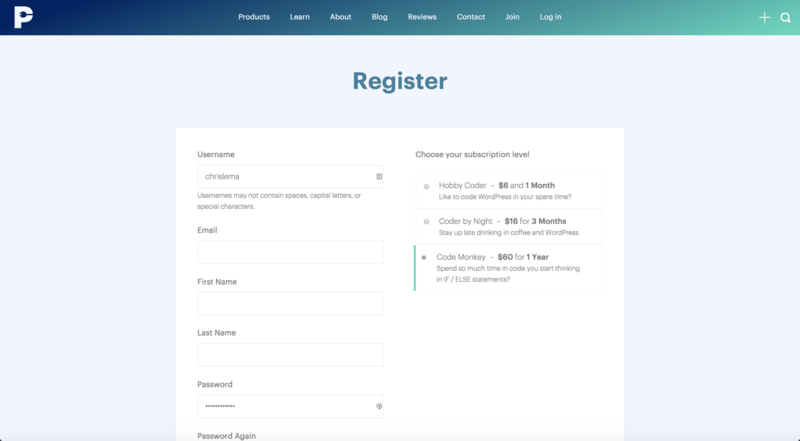 Which explains why he’s written examples for building your own payment gateway, and more code for how to create, cancel and extend member’s subscriptions. I’m not saying the plugin is only for developers. I am saying that developers, who try to customize the code for some of the membership plugins I’ve already reviewed and others I will soon review, will feel much more comfortable working with Restrict Content Pro. Especially if they want to change how it works in little areas here or there. I told you that Pippin doesn’t make mistakes when it comes to scope. It’s not like he missed a key feature because he fell asleep in the middle of the day. Instead, I think the answer is that he focused on a clear scope (like we talked about with WP-Members) and then made it easy for developers to take it in other directions. This brings us to a key takeaway from Restrict Content Pro. Make your product as useful to developers as it is to customers. It will get you broader reach. Make your product as useful to developers as it is to customers. It will get you broader reach. Mind you, I’m not saying build tools. I’m saying build a solution that truly lets you solve a single specific scenario at least, and then create a way for others to embrace and extend it. If you want to see how works, check this out. He’s running it on his own site (no duh). As I started building a sample site, I thought about what kind of site would be a perfect fit for Restrict Content Pro and suddenly I thought about a support site. I had no idea why I had the idea. I thought I was pretty original. So not original. Right? It’s because I’d been to his site so often, it just came naturally to me. But if you want to experience it, head over to his site. You’ll find it’s a simple and clean way to help you learn about plugin development, while testing out RCP. Plans, in RCP, can have durations (which is great). As those plans get ready to expire, you can send out notices (yeah!). Does it try to do everything? No. Can you do even more than it does? Sure. And I probably should mention that via an extension for Easy Digital Downloads, it can connect with an entire eCommerce platform. So you know – the potential is driven by what you can imagine and what you can code. I told you yesterday, the scoring is based on my own criteria, but your criteria counts just as much. As does knowing what you’re trying to build. That said, here’s how it scored for me.